With the GSNC Mags&Munchies Program beginning in a little over a month, now is the time for Troop Leaders to prepare their Girl Scouts for the Mags&Munchies season. Whether your Troop is hosting a booth sale or individual Girl Scouts are going door-to-door, it is important to be safe when selling. GSNC has put together a few Safety tips for Troop Leaders to go over with their Girl Scouts. Show you're a Girl Scout - Wear your uniform, membership pin and/or Girl Scout clothing when selling Mags&Munchies. Buddy Up - Use the buddy system at all times. It's not just safe, it's more fun. Partner with Adults - Adults must be present when girls are taking orders, selling or delivering product. Plan Ahead - Avoid walking around with large amounts of money. Hand it in to the Troop Mags&Munchies Manager as soon as possible. Do Not Enter - Never enter the home or vehicle of a person when you are selling or making deliveries. Be Safe when Walking the Neighborhood - Follow safe street pedestrian practices. Be Net Wise - Take the GSUSA Internet Safety Pledge before going online... and remember, Girl Scouts cannot collect money online. Decide who will be on the account - Required is a minimum of 2 signatures – one of the Troop Leader and the other a member of the Association Service Team (Treasurer or CAV). Request a letter from Council on Council letterhead: Once you have the names of the signers, the bank you wish to open the account in, and your troop number, contact the GSNC Service Center for the letter. Once you receive the letter (which also indicates the Council’s ID number) you can go to the bank and get signature cards for your new account. IMPORTANT: Remember to indicate that all bank statements be mailed to the Leader’s address - not the council’s address. I Can’t Wait to… Volunteer! I Can’t Wait to… Volunteer!! Girl Scouts of the USA is introducing a new recruitment campaign that allows girls and adults to complete the sentence “I Can’t Wait to…” I would complete the sentence with the word Volunteer! I am a natural born volunteer and I have been doing it a long time. I think it started when I was a child in Girl Scouting, I built upon my experiences in high school when I was in the Volunteer Club, the sorority I belonged to in college always performed community service and when I started my professional career, I worked for large corporations that had organized employee give back days. Today, I belong to Rotary, serve on my library board and I’m a member of several professional organizations as well. The volunteer experience that I value the most was my time as a Girl Scout Leader. I loved being a Girl Scout as a child and wanted my daughter to have an experience she would treasure as well. As one of the few full time working moms at the time, I didn’t want to be the Troop Leader so I volunteered to be a helping mom who brought snack to the Daisy Troop meetings or chaperoned the trips. When my daughter was a Brownie, I was the Troop’s Fall Products coordinator (now called Mags&Munchies). When my daughter was ready to bridge to Juniors, her Leaders decided they were not returning for a variety of reasons and the existing Junior troop needed a Troop Leader… so I finally raised my hand and took the training to become a Troop Leader. It was the best investment of time I could have made. I got to spend more time with my daughter, I met some great women who have become my lifelong friends and I helped other girls become confident and caring young women. Today, there are so many ways to be a Girl Scout Volunteer. Yes, we still need troop leaders, but we also need volunteers who can help out at one day events, or who can share special skills like sewing, gardening or robot building. We need volunteers who can be role models for girls in non-traditional career paths like scientists, computer programmers, auto mechanics and engineers. If you had to fill out the sentence “I can’t wait to …" could you see yourself filling the blank with “volunteer"? If yes, then you need to contact us and we will find a way to help you fulfill your potential as a volunteer! Fishing at Jones Beach’s Fishing Pier with I FISH NY! 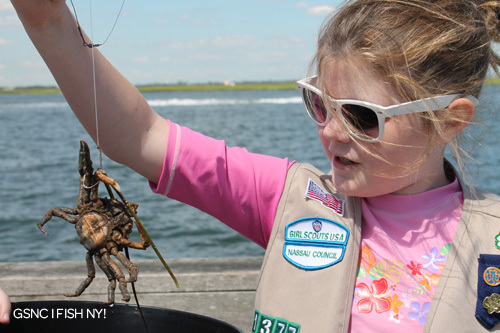 GSNC Fishes at Jones Beach’s Fishing Pier with I FISH NY! 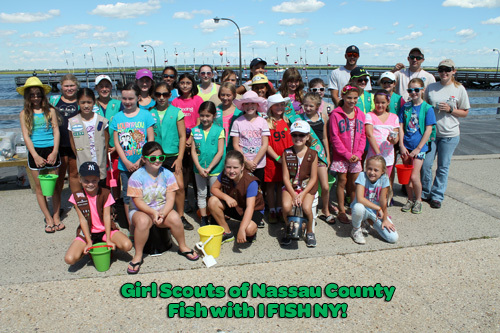 Yesterday, Girl Scouts from Nassau County fished the waters of Long Island at the Jones Beach Fishing Pier! 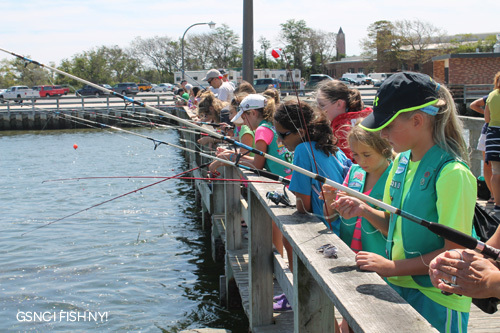 Girls learned all about some of the different fish that swim in our south shore bay waters and gained knowledge on the fishing regulations for the area. And of course, they learned how to bait a line and cast their rods into the waters off the fishing piers. A few girls caught some fish and one girl even caught a spider crab. We provided the rods and bait; the girls provided the whale of a story to bring home!